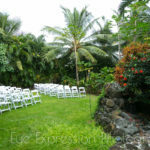 The Ohana Retreat on the Big Island of Hawaii is a great location for a wedding. Not only are there great grounds for the ceremony and photos but there is also a wonderful pavilion that makes a great reception site. And, there are two houses on the property where you and your guests can stay. Hawaii Photographer photographs both simple and luxurious weddings. For us the client is the most important aspect of the wedding and not where the wedding is held or how much money is spent on the wedding. The Ohana Retreat offers a beautiful setting for both simple to luxurious settings. I loved the sparkles for their reception exit and that they were willing to take the extra time to do some blurred motion photos.